(From Panasonic lens literature) A total of 10 lens elements in 9 groups, including a large-diameter aspherical lens, give this bright, standard f/1.4 lens a superb optical performance. A large-diameter front lens ensures sufficient peripheral light levels, and a large-diameter front aspherical lens reduces light degradation all the way to the lens periphery. The result is high resolution and absolutely minimum lens distortion. Four extra-low dispersion lenses suppress chromatic aberration, thus minimizing color bleeding. When the D SUMMILUX lens is used with the LUMIX DMC-L1 digital camera, the user has an aperture ring as well as a focus ring at his or her fingertips. These rings provide the same kind of easy, pleasant, intuitive operation people enjoy with the familiar film camera. Unlike the 50mm lenses used on conventional 35mm film cameras, the D SUMMILUX lens uses a floating focus that reduces minimum photographic distance to just 38 cm. In addition to the lens's high optical performance and low aberration, maximum photographic magnification of 0.18x (35mm equivalent), which combines with the f/1.4 brightness allows beautiful macro shooting. The seven aperture blades create a rounded shape. This combines with the f/1.4 brightness to produce a beautiful smoothness in out-of-focus areas at larger aperture. Multiple lens coatings reduce ghosts and flare to an absolute minimum, helping the D SUMMILUX deliver an optical performance that meets Leica's lofty standards. I purchased this lens when I purchased a GH4 (see "The Mighty Mirrorless" review). I am glad to say that this is a great companion for the M4/3s GH4. From the photography side, this lens is very fast and very sharp. I have had several photographer friend that have made several positive comments on the speed and sharpness that this lens produces. Some of the comments even came from some FX camera shooters. Burst mode of this lens on the GH4 is insanely fast. I have only test the high .jpg setting in burst mode so I'm not sure if the large RAW will slow it down significantly or not. Portraits photos from this lens are awesome as well (see GH4 review for sample pic with this lens). The bokeh has a very smooth finish to it at the f1.4 and I have found that it is consistent throughout the stops. The video performance is almost photo quality, very sharp and the bokeh is still has the smoothness to it. I have used this lens on some stabilizing rigs and the footage is very usable even though it does not have O.I.S. built in. The focus ring is very smooth and has a good amount of surface area to adjust focus with while following a subject when shooting video. The focus bump is not overly obvious, subtle and smooth as well. I use this lens mainly for shooting interviews in combination with the GH4 but I have used it for stills on several occasion as well. 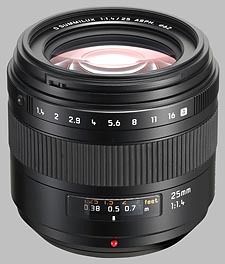 If you are looking for a very fast M4/3s lens then I would not hesitate to get this lens. I highly recommend it! Probably one of the best primes i ever had. Zuiko 50 F2 is as good, however this one here has CDAF support, has F1.4 and is not too long for indoor shooting. It is no macro. 38cm focus distance is far from being macro capable. Amazing lens. I had the 30mm Sigma and the image quality is night and day. The Pana-Leica 25mm is well worth the hefty price tag. Very sharp at F1.4 and even sharper at F4. I use this lens as a full body portrait lens at F8 with a RAY FLASH on the FL-50r. Finally, a fast standard lens for 4/3. Expensive. Hard to find. No SWD version available. Aperture ring doesn't work on Olympus cameras. This is a lens that Olympus should have made and had available in large quantities when the E-1 first shipped. The biggest issue people have with the 4/3 format is that the high-ISO sensitivity of the cameras always lags behind APS and 24mm x 36mm cameras. A fast prime can compensate for that somewhat. This is an excellent lens. People complain that it's too bulky and for the smaller bodies it may be, but on my E-3 it feels right at home. Focusing is fast. I wish Olympus would enable the aperture ring, but that's almost a silly thing to mention. I'm not sure that I don't prefer using the control wheels, anyway. Overall, this is a must-own lens, even if it is too expensive. Now if they'd just come out with one of these at around 18mm we'd start having a set of lenses that could equal what we OM users had 30 years ago.